Gone were the days when one would go for a run or complete his daily exercises without getting any idea of the enormous efforts he has exerted to stay fit. With the level of technology we possess today, we have been able to create a device that tracks our fitness activities and statistically presents data to it users, the Fitness Tracker. Just like listening to music is essential when exercising, fitness trackers are a must have for anyone who needs accurate stats of his efforts. And because the market is flooded right now with local and international brands manufacturing their very own with varying perks and attractive functionalities, I’m going to help you choose the best model for your needs and budget. If you’re looking for a fitness tracker with an attractively low price, you might as well consider Huawei fit among all other fitness trackers. Aside from its relatively low price tag, it offers basic functionality that includes heart rate monitor in a classy, traditional look that is embellished with a waterproof design. It has a customizable running plan and has multi-sport modes which includes cycling, running and walking. Another great feature is daily tracking of step count, distance covered and calories burned. It also has sleep features that is on par with the best fitness trackers beyond its current price range. Despite its competitive look and functions, it lacks luster in its interface and some additional useful perks for your workouts. This fitness tracker deviates from the normal look as it boasts a very unique design that is alike to a bracelet and not may fitness trackers out there can come up with such originality and uniqueness. Despite being packed with sensors and features essential to your exercises and workout, this thing can even last for a week before running out of juice. It monitors the heart rate throughout the day and also tracks the sleep patterns. Another nice feature is the Smart Alarm that wakes you up silently at the optimal time. Though not really the most famous entry in the Fitbit series, Surge provides most functionality you would expect from fitness trackers with GPS tracker added for those who would go on long hikes. It tracks your daily activities including step count, workouts, calories burned and stairs climbed. It monitors your sleep and has a silent alarm to wake you up. One setback with this device is the low battery capacity that is lower than the other average fitness trackers. 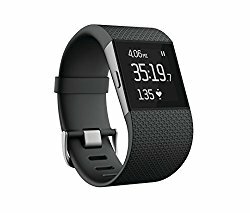 Nevertheless, the Fitbit Surge is powerful enough to be your next fitness tracker if you’re willing to overlook its battery’s limitation. This entry in the Fitbit series tends to bend into the classic watch-look rather than the usual plain and simple design of fitness trackers. While very elegant, not everyone may want to wear it because of its weird accents and features. Specs-wise, this thing packs a battery life beyond what your normal fitness tracker has as it can go for 5 straight days before recharging it and automatically gives you the data of your workout results after doing your exercises. PurePulse offers automatic checks on your heart rate and lets you know your workout intensity by showing where you are in the heart rate zones. Like the previous trackers, the Fitbit Blaze tracks daily steps, calories and distance walked. It offers call and text notifications. With a great battery life and wide array of features, this Fitbit device may just be what you need. If you want to lean on the more expensive side of fitness tracking, Withings Steel HR is one of your choices. Boasting a design that is identical to the classic wristwatch, this is suitable for those who would want elegance and fitness tracking in the same device. Offering the most basic functionalities like heart rate monitor, this can be your go-to device when you want to jog yet doesn’t want to look too sporty. The heart monitoring feature is a bit more complex here, since it monitors the heart rate during workouts and resting heart rate at night that helps assess overall heart health. It tracks walking, running, swimming and sleeping and it’s water-resistant down to 50 meters. It auto-syncs the data to your phone so you can better track your workout and sleep trends. The Polar Ft7 tracker is another high quality device that tracks daily activities and heart rate using a chest strap for accurate heart rate monitoring during low and high intensity workouts. It has smart calorie calculator that detects your workout intensity and delivers a more accurate calorie calculation. It has a big screen and it’s very user friendly which makes it easier to use and monitor your activity. This tracker really delivers with quite a punch. With its ultra-long battery life, you don’t have to worry about replacing the batteries for around six months, unlike other fitness trackers which you have to plug-in after a couple of days. One stumbling block for this one, though, is the lack of phone notifications but this is in exchange for a big user friendly screen. The Fitbit Charge 2 has two groups of features, the standout and the essential. The standout includes PurePulse smart heart rate monitoring, multi-sport modes tracking with connected GPS, cardio fitness level, call, text and calendar alerts and guided breathing sessions. Whereas the essential features include all-day activity tracking, auto sleep tracking, auto exercise recognition and reminders to be more active, as well as it’s good battery life that can last for up to five days. This is probably the best fitness tracker that you can buy in the Fitbit series. There’s no denying that the price may be a bit higher than other devices in the market, but that makes it the best pair for anyone who wants to track his workouts and heart rate without spending a lot of money. With phone connectivity and a large screen to view notifications and data, you won’t miss anything with this device. This fitness trackers offers a lot of features that are really useful in your workout routines that include built-in music, totally phone-free. This can be done by uploading your music straight to the TomTom Spark 3, so you don’t have to take out your phone the next time you go on a jog. It also features heart rate monitoring and on-screen navigation which is handy when exploring new places while jogging. One of the main features is the GPS running watch which measures time, distance, speed, calories and a lot of other things on the go. It also has smart tracking and multi-sport modes which makes it a high quality fitness tracker. It is waterproof down to 40 meters. The battery can last for up to three weeks (without GPS) and 11 hours (with GPS). You get what you pay for with this fitness tracker as the price may be a bit too steep for the pocket, but it provides all the features you could ask for that will complement your workout. Starting with its huge battery life, it could take almost a full week before you have to recharge the device. GPS features and heart rate monitoring is also embedded in the device while being packaged in classy design you’ll be proud to wear while working out. The GPS integration feature connects to satellites to provide the most accurate tracking of your run or jog. Smart metrics tracks distance, steps and personal records. Heart-rate monitoring runs 24/7 all day and night to provide the most accurate calculations. It connects to the Garmin Connect App on your phone to give you activity reports. It’s also durable and water-resistant. If you want high-end fitness monitoring at your disposal, you can’t go wrong with Garmin Vivosmart HR+. Due to Samsung’s recent significant changes into its wearable line and efforts to improve its Gear series, it has landed in our number one list as the best fitness tracker today that has a heart rate monitor. With its latest update, it can support the most recent iOS version and android phones as well. The Samsung Gear Fit 2 tracks steps, calories, heart rate, sleep quality and activities. It auto-tracks exercises and provides accurate data and summary of your workout session.It plays music and can display your smartphone notifications on its screen. It’s also water-resistant which gives you more peace of mind while running under the rain or in wet conditions. With its gorgeous screen, design, fitness tracking and GPS features, the Samsung Gear Fit 2 can be the best fitness tracker for the buck. Looking at the above 10 fitness trackers, most of them can provide a lot of useful data that helps us track our daily activities and workouts in order to reach our health and fitness goals. Each fitness tracker offers a range of features, it may be useful for some and not much for others. I guess the point would be to look for a fitness tracker that fulfills your requirements. We have come to the point in our technology advancement where we can track our health and workouts in the most convenient way and whenever we want to. You can have your next high quality fitness tracker for a small amount of money.